Welcome To our School Website. 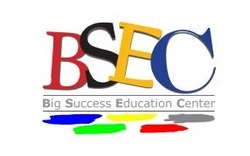 Big success education center (Bsec) is a Christian school with American standard. Visit BSEC school, and you will notice the BSEC difference from the moment you walk in. Parents tell us it feels like home. Everything we do at BSEC, from our professional staff, to our school programs, to our clean, safe environment assures parents that their child will be safe, happy, and learning. Our proprietary balance learning is brought to life each day by passionate teachers who nurture your child’s mind, body, and heart. In BSEC School we train our teachers to consistently deliver our standards-based curriculum. Because we are committed to furthering each child’s development and learning, we make sure teachers have what they need to teach and to focus their energies on understanding your child and what he or she needs to learn and grow. The extraordinary quest of parent's quest to give their siblings nothing but the best in education has been the major reason we choose to give our best and remain top class quality school. With our passionate staff, comprehensive curriculum, and high standards, we partner with parents to provide the best education and care for every child. As founder and director of Big success education center and also the founder of IIMAC Non profit/WCG101 Nonprofit . I oversee the development of curriculum and training for BSEC School. I am a firm believer in BSEC's balanced learning curriculum because we place special emphasis on literacy instruction, hands-on learning activities, building a foundation for understanding mathematics, the integration of technology to support learning, and most importantly, on the development of confident, happy children. The concept of balance is core to the BSEC approach to curriculum development and programming. We believe each child is unique, capable, curious, and in the process of discovering how the world works. We want to encourage this natural process by providing the kind of teaching and learning environment that will fosters the development of well-rounded children. Our balanced learning curriculum provides teachers with an instructional blueprint that enables them to promote and support children’s learning in multiple ways—through listening, seeing, hearing, touching, and play. We consider multiple aspects of development and learning—cognitive, social-emotional, physical, and creative—in the design of our research-based curriculum. The engaging learning activities that make up the curriculum is appropriate for children at different stages of development—from six months to five years. We recognize the necessity and value of well-planned, developmentally appropriate experiences for children. Our curriculum and training experts create and select curriculum for teachers to use to address specific learning outcomes in seven different learning domains, as once again, balance comes into play. The learning outcomes identified for each class level provide a learning path that helps teachers make their daily instruction purposeful and intentional. Another important component of the balanced learning curriculum deals with character development—understanding concepts like friendship, generosity, and honesty which is at the heart of our culture at BSEC. One reason I opened my school was because of my passion to embed a character development into the curriculum from an early age. I knew from my many years of teaching and rearing my own child/ children that good moral conduct doesn’t just happen. To raise a generation of compassionate adults, we need to start young and make caring for others as a way of life whether at home or at school. We share our love and pass on the kindness worldwide starting from zero age. Our schools recruit the best teachers and train them to bring our Balanced Learning curriculum to life in all BSEC classrooms. Having purposeful, engaging curriculum and the instructional materials needed to teach gives our teachers more time to focus on individual children need and growth. Our teachers are proud to be part of an organization that is committed to making a difference in children's live. We are committed to continuously improving every aspect of the care and education children receive in our schools. Our unique ten elements foundation technique is made up of leading early childhood experts who make recommendations for the continual improvement of our education and training programs. We use assessment instrument, DVD’S , the world class a ssessment, at the Pre-K and Kindergarten levels to continuously assess the effectiveness of our curriculum and delivery, we guarantee your child will have consistently high marks in academic levels. The BSEC School is truly focused on carrying out the best blend of curriculum and assessment for children. I feel honored to have the opportunity to play a role in its continued emphasis on providing the best in early childhood education. Every child deserves the best we are here to provide the best quality education irrespective of the financial strength of the parents. We give your child a way to express, feel, touch, understand, explore. Above all we take them on a journey as they explore and delve into amazing informative details of various subjects through our imported DVD'S , we take them to the world of amazing cultures, Animal kingdom, Galaxy, Ocean creatures and our universe as a whole, including educational documentaries. We also teach them some basic languages like French, German and Spanish .